This is part of my series to discuss 500 years of Reinheitsgebot. The 23rd of April is getting closer, and more media is starting to be interested in and report about the Reinheitsgebot. FAZ, one of Germany’s largest and most influential newspapers, started a blog about beer and the Reinheitsgebot. On a first glance, the purity law limits the possibilities of a brewer. In my opinion, you can’t forget that our, i.e. the Bavarian resp. the German understanding of what beer is, is based on this 500 year old law. If a brewer nowadays wants to produce a fermented barley drink with cherry flavour, then it may be an interesting drink, but it doesn’t conform to our grown understanding of beer. I’d find it a pity if such an old tradition like the purity law, even with all legitimate criticism, would be sacrificed to a modern and maybe only temporary trend. The solution would actually be quite simple: where beer is printed on the label, purity law must be in it. If somebody wants to brew anything else, they need to call it differently. Brewers and public authorities/legislative authority/EU would only need to agree. Well, to put it mildly, this is infuriating. I’m especially appalled by how Matthias Trum, who has a background in beer history, can spout such completely ahistorical nonsense. As I’ve shown before, people in Germany, even Bavaria, have brewed plenty of beer in the last 500 years that doesn’t conform to the purity law at all. Even though a minimalistic understanding of beer as only containing malt, hops, water, and yeast may have been prevalent in Bavaria, it doesn’t reflect reality. And even if you accepted this minimalism as premise, it still doesn’t apply to the rest of Germany until about 110 years ago. Brewing with other ingredients, such as juniper, marjoram, thyme, oregano, elderflowers, fir tips, birch tips, rose hips, cream of tartar, honey, ginger, gentian roots, bitter oranges, lemons, cardamom, rice, and salt, was common all over Germany. That was the understanding of beer in much of Germany from the 16th to the end of the 19th century. And it’s a sign of a rich and diverse brewing culture. When Matthias Trum claims that “our” understanding – I assume he’s implying the German understanding – of beer is equal to the Bavarian minimalism, then this is not only ahistorical, it tries to erase this rich and diverse German brewing culture outside of Bavaria with a relatively recent trend: pale lager beers only started being produced in Vienna in 1840 and Bohemia in 1842, while in Bavaria, dark lagers were prevalent until the end of the 19th century. Only in 1895, Helles started being served in Munich. And that is one issue that I have with Matthias Trum’s statement: it claims “tradition” for a relatively recent trend in beer brewing, and it claims “tradition” for beer styles that weren’t even brewed or served in Germany for the majority of the last 500 years. But it’s part of a pattern that I noticed: Bavarians try to claim the prerogative on how beer is meant to be, and try to force their narrow and minimalistic definition onto everyone else in Germany. I called this the Bavarian Beer Chauvinism. I find this chauvinism particularly heinous because it claims tradition where there is none, it built up a narrative that is not backed up by historical accounts, and at the same time, denies the existence of most of Germany’s brewing culture, at best it draws a distorted picture that beer over 500 years ago was only brewed with bad ingredients or other such nonsense. Matthias Trum’s suggestion at the end shows exactly that: he’d like to deny using the term “beer” to everyone that refuses to adhere to the Bavarian minimalism. Very broadly and drastically interpreted, this could mean the end of beer in Germany imported from other countries with rich and diverse brewing traditions in Europe: plenty of English beer doesn’t conform to the purity law, as does a lot of Belgian beer, and most likely many brewing traditions, as well. And it’s not just about the straw-man “cherry beer” that Matthias Trum is attacking, there are lots of ingredients that are perfectly safe for brewing that would help brewers in creating new, exciting beers, or even just allow the recreation of historical German beers. I, for one, would like to see Matthias Trum and his Schlenkerla brewery to recreate a historic Bavarian beer such as Farrnbacher beer, as it was brewed in the first half of the 19th century, and then he will realize how nonsensical the purity law is, and how harmful it actually is both to the history and the future of German brewing. Bamberger Bier in the early 19th century sometimes had salt added to get it to clarify more quickly. This historic German beer style used to be a popular export product. Besides wheat and barley malt, other ingredients were used, such as juniper berries, marjoram, thyme, and plums. Other sources mention fir tree bark, fir tips, birch tips, burnet, elderflowers, and rose hips. This beer from Bavaria was reportedly brewed with sugar, juniper berries, and cream of tartar. In this beer, the barley malt, wheat malt and oat malt was augmented with honey and sugar. Brewed with juniper berries and ginger. Brewed with gentian roots and bitter oranges. This beer was brewed in Germany, and besides the usual ingredients of barley malt, wheat malt and oat malt, brewers also used oregano and honey. This beer was brewed with sugar. This wheat beer was brewed from two different types of wheat malt, barley malt, oat malt. Besides that, brewers added sugar, cardamom, and lemons. Alternatively, brewers could substitute the lemons with cream of tartar. A wheat beer recipe from the first half of the 19th century mentions ingredients such as syrup (it’s unclear which kind of syrup), juniper berries, ginger, and salt. Wheat beer in Bavaria in the first half of the 19th century used to be brewed with either top- or bottom-fermenting yeast, unlike nowadays. When bottom-fermented yeast was used, Branntwein (brandy) was added. Also, the recipe gives a grist of 2/3 barley malt and 1/3 wheat malt. While only the addition of brandy is strictly against the Reinheitsgebot respectively its modern version, this recipe goes very much against modern norms that are considered to be “traditional”: nowadays, only top-fermenting yeast is allowed for beers containing any other malt than barley, and in order to be called a wheat beer, the grist must contain at least 50% wheat malt. Source: “Vollständige Braukunde” by Johann Carl Leuchs, published in Nuremberg in 1831. In a previous article in which I discussed the original source of the Reinheitsgebot, or purity law, I argued that the mention of barley instead of malt is of significance. Any use of unmalted grains is of course rejected by proponents of the purity law, and also the modern beer legislation, the Vorläufiges Biergesetz, codifies malted barley as the only allowed grain for bottom-fermented beer, and malt from any grains for top-fermented beer. In Germany, it is at the moment not allowed to brew beer that contains unmalted grains, adjuncts, or “Rohfrucht” as they’re called in German. Already back in the 1960’s, the Reinheitsgebot proponents were fiercely against any change in German beer legislation and any attempts in harmonizing German legislation with EC legislation. The great fear was “chemistry” and “chemicals”. First there was the fear of hop extract, then there was the general fear of chemicals, culminating with the infamous Franz Josef Strauß warning about “chemistry in the beer”. Even today, reinheitsgebot.de insists that the use of unmalted grains requires artificial enzymes (see answer to question 2) to convert its starches into fermentable sugars. Nothing is further from the truth. To explain why, I need to talk about why barley is malted in the first place. The process is malting means that barley kernels are soaked in water. This starts the germination process, the barley basically starts the growth process. This produces enzymes that can convert starch into simple sugars, cell walls in the grain and proteins start to break down, the whole grain is being modified. If the maltster lets this process continue, whole plants would start to grow, and nothing would be left of the grain. That’s why after a few days, the so-called green malt is dried and kilned. Kilning at lower temperatures gets you a paler malt in colour, while kilning at higher temperatures gets you darker malts. The kilning process also destroys some of the enzymes. But brewers need these enzymes to later convert the malt’s starches into simple sugars during mashing. So it is the maltster’s job to produce malt that still contains enough enzymes. The amount of enzymes in a certain amount of malt decides what amount of starches can actually be converted. This is called diastatic power. Paler malts usually have a higher diastatic power, while darker malts often have a lower diastatic power. Dark malt, like dark Munich malt (used to make dark-brown lagers, the classic Munich style of beer), has just enough diastatic power to convert itself, but not more. A lot of specialty malts, like caramel malts, dark kilned malts, and roasted malts have no diastatic power at all. They always require a certain share of enzymatic base malts to convert their starches. Diastatic power for malts is specified in either Windisch-Kolbach units (°WK) or degree Lintner (°L). Conversion between the two is easy: °WK = (°L * 3.5) – 16. Usually, about 105-125 °WK (~ 35-40 °L) are necessary in a grist to fully convert all starches. Base malts can range from 140 °L (Pilsner malt) down to 40 °L (Munich malt) in diastatic power. A chart with typical values can for example be found here. So, in order to brew with unmalted grains, there are two things that you need to make sure: first, you need enough enzymes by adding enzymatic malt into your grist, and second, you need to make sure that the enzymes can reach the starches. Some adjuncts thus need to be cooked or otherwise treated with heat to make the starch accessible. Flaked barley can be boiled, corn can be made into flakes (like cornflakes, except your breakfast cereal is fortified with a whole lot of other things that you may not want in your mash), oats can simply be rolled, while wheat can be torrified. Calculating how much malt you need is easily. Suppose you have a base malt with 110 °L diastatic power. In total, you need 40 °L in your grist. That means you need at least 100*40/110 = 36.36 % of base malt in your grist, the rest can be unmalted grains. The lower your diastatic power, the higher your share of base malt, and with 40 °L Munich malt, you need 100*40/40 = 100% base malt. So why is an all-malt grist still promoted? Because of historic reasons. Brewers back in the day could have easily worked with unmalted grains, and probably also did. But back then, even the malt wasn’t quite the sure thing as it is now: maltsters several hundred years ago didn’t have the ability to finely control, measure and evaluate their malt production. Historically, malts were often relatively dark (because it’s hard to finely control kilning temperatures), undermodified (i.e. some of inner structures weren’t properly broken down), and low in enzymes. These types of malt are hard to work with, unless you employ certain techniques. Decoction mashing, as practiced by German brewers for centuries, is one way of making the most out of malts that were badly modified and low in enzymes. In the 19th century, one of the big achievements of continental brewing was to learn how to produce pale kilned malts, but the decoction mashing tradition remained. British brewers on the other hand, who had known how to produce pale malts for much longer, have traditionally employed a mashing regime which is nowadays often called a single-step infusion mash. The grist is infused in water and rested at a certain temperature. Because the malt is better modified, and relatively rich in enzymes, it can easily convert all the starches without requiring decoctions to make it more accessible. The same technique is employed by most homebrewers nowadays due to the high quality of malt, as well as commercial brewers that try to avoid energy-intense decoction mashes. Adjunct brewing is a well-researched topic in brewing science, and even German scientific brewing literature contains plenty about it. So, from a purely technological point of view, there is no argument against the use of unmalted grains when producing wort. With some care, adjuncts can be easily used without requiring any artificial enzymes or other “chemistry”. Brewers can also benefit from a wider range of base materials, as unmalted grains often impart slightly different qualities in the beer compared to their malted equivalents. It is not bad per se, nor is it artificial. Rejecting unmalted grains is dogmatism, in my opinion, as it provides and ensures no quality in the beer, but instead just arbitrarily restricts brewing and thus variety. In the end, the prohibition of unmalted grains in German beer is also an insult to German malting. German maltsters produce a wide range of all kinds of base malts and speciality malts, exactly matching very strict specifications in colour, kernel modification, friability, protein content, diastatic power, and a whole lot of other properties. At the same time, German legislation specifically disallows German brewers to build upon some aspects of this high quality work. And the proponents of the Reinheitsgebot even support that, even though it makes no sense other than to bring up that bogeyman that is “chemistry in the beer”. Is The Purity Law a Uniformity Law – Does The Reinheitsgebot Prevent Diversity? In this part of my series of “frequently questioned answers”, I will discuss the question of diversity or lack of diversity that comes with the German purity law, as it was brought up in the FAQ on reinheitsgebot.de. Question 9: Is the purity law a uniformity law – does it prevent diversity? Despite the limitation on malt, hops, water and yeast, German brewers have an extreme diversity in ingredients to brew good beer. More than 170 different hop varieties, 40 different types of malt, about 200 different yeast strains, the liquor (brewing water) also has an influence on the beer, just like the brewing method itself. According to them, that gives the freedom to brew 1 million different ways of brewing a beer according to the purity law. If there were a million different ways, then why is Germany’s beer landscape so uniform? Go to an average supermarket, and have a look through the aisles, what do you see? Twenty different brands of Pils, a few Hefeweizen, maybe a Kristallweizen, a Schwarzbier or two, if you’re lucky you’ll find a Helles, a Kölsch and/or an Altbier. In addition to that, the typical “world beers”, generic lagers from major international producers, and maybe bottled Guinness. And that’s it. Some focal points of great, local beer, like Franconia, remain local, and are hard to get in other parts of Germany, with the exception of specialty beer shops, of which there are only relatively few. And even if you look at these mainstream beer styles, there is very little variation inbetween. In blind taste tests, people consistently fail to distinguish and identify major German Pils brands. I’ve even seen a blind test on German TV where people failed to identify what they claimed was their favourite Pils which they would always buy. This makes all the major brands essentially interchangeable, and the beer market cannot possibly be driven by variety, but by brand reputation only. So, the question remains: if the purity law were actually an enabler in beer diversity, why is the German mass market so dominated by mostly uniform beer? How Accepted Is The Reinheitsgebot With German Consumers? This time, we’re discussing consumer acceptance, which is something, as reinheitsgebot.de claims, is very high among German consumers. Question 7: How Accepted Is The Reinheitsgebot With German Consumers? According to some study, 88 % of all people asked want beer to only be produced from water, malt, hops and yeast. 89 % of all Germans have heard of the Reinheitsgebot, in the East of Germany it is even better known than in West. 77 % of all people asked would like to see a purity law for other foodstuffs. According to some other study, 79 % of all Germans think that German beer brewed according to the Reinheitsgebot requires special protection. Well, a recently published study paints a different picture: more than 60 % of the over-60 demographic said that the Reinheitsgebot is very important in their buying behaviour. On the other hand, only 25 % of the 30-and-under demographic agreed with that statement. Also, only primarily the older demographic would agree that German beer is superior to foreign beer because of the purity law. Generally, support for the purity law in Germany seems to be going down. Another thing to point out when people ask for a purity law for other foodstuffs: it already exists. At least in the same form as it exists for beer. Germany has complex legislation that quite strictly regulates what you can and cannot put into certain food, including the requirement to declare everything that is put into the product. If consumers want a purity law for other foodstuffs in the same restrictive manner as the 1516 Reinheitsgebot, that’s an entirely different matter, though. But then, which consumers would really like to see a limitation in bread ingredients to only e.g. water, wheat, salt and yeast? No other herbs or spices, no other grains, just an arbitrary list of ingredients. Doesn’t exactly sound appealing. Which Additives Are Prohibited When Brewing According To The Reinheitsgebot? Last time, I wrote about whether German brewers still brew according to the purity law. After a detailed discussion about what is actually allowed according to modern law and how reinheitsgebot.de is imprecise and conflates the historic purity law with the modern law that is actually in effect, I will answer a follow-up question to shed more light on what the “according to Reinheitsgebot” thing is actually about. Question 3: which additives are prohibited when brewing according to the Reinheitsgebot? We previously established that you’re allowed to use barley malt, hops, water and yeast for bottom-fermented beers, and for top-fermented beers, you can also use malt made from cereal other than barley, various brewing sugars, and food colouring made from sugar. And, what I didn’t mention last time, because it’s such an obscure niche, artificial sweeteners for some low-alcohol beers. reinheitsgebot.de in their answer insists that it’s only malt, hops, water and yeast for beers according to the Reinheitsgebot, and say anything else is prohibited, while the EU allows a whole lot of other things to be put into beer. This list contains things from food colouring made from sugar, to lactic acid, to various artifical sweeteners and stabilizers. Now, what they don’t mention is that the modern Vorläufiges Biergesetz does allow some of these ingredients. And for others, in particular lactic acid, there’s a way how German maltsters and brewers “cheat” the system. Lactic acid, among other things, is often used to treat the liquor (brewing water) to change the pH level. Lactic acid is naturally produced by lactic acid bacteria, and commercially available in food-grade quality. Now, as a German brewer, you can’t just add lactic acid, so there’s a type of malt, called Sauermalz, that German maltsters produce: the malt is inoculated with lactic acid bacteria, which then produce lactic acid. The malt spec tells you how much lactic acid it contains, and based on how much lactic acid you want to have in your mash, you adjust your grist to use more or less Sauermalz. deutschen Reinheitsgebot gebraut” and says that beer sold under that label can’t contain certain ingredients that are actually allowed according to the Vorläufiges Biergesetz. In particular, it excludes food colouring, sugars, and any other gas than nitrogen and CO2 that has been produced through beer fermentation. And that’s the mess of how this more strict Reinheitsgebot that vaguely resembles that law from 1516 is implemented within the legal framework that is the Vorläufiges Biergesetz of 1993. It’s a patchwork, it’s confusing to customers that try to understand the legal basis and limits for beer producers, and in the end only comes down to a marketing phrase that brewers can use on their beer labels and their advertising if they restrict themselves even further beyond the limits that are imposed by the law. But at least we got to bottom of what the marketing phrase “Reinheitsgebot” really means and how it’s implemented legally. Do German Brewers Still Brew According To The Reinheitsgebot Of 1516? The website reinheitsgebot.de has an FAQ with questions and answers that are supposed to explain the purity law. This is my first article of a series of “Frequently Questioned Answers” where I will discuss these explanations. Unfortunately, I can’t directly link to the individual questions and answers, but bear with me. I will summarize the website’s answer, and add my own comments. Question 1: do German Brewers still brew according to the Reinheitsgebot of 1516? Their answer: according to reinheitsgebot.de, the purity law of 1516 forms the basis for the current law, the Vorläufiges Biergesetz of 1993, and because of that, beer is still a natural product like 500 years ago. But the production has changed and has been modernized, where all steps and the natural ingredients are closely monitored. But even nowadays, German breweries aren’t allowed to use artificial aromas, artificial colouring, artificial stabilizers, enzymes, emulsifiers, or preserving agents. Beer is still made out of malt, hops, water and yeast, and is as natural as ever. My answer: the claim that the purity law forms the basis for current legislation is indeed a bold one. As discussed in a previous article, the original purity law allowed barley, hops and water, with a most likely implied use of yeast or spontaneous fermentation. When you compare this with the Vorläufiges Biergesetz, § 9 (1), this seems indeed true: it says only barley malt, hops, water and yeast may be used for bottom-fermented beer. Wait a second… barley malt? Bottom-fermented beer? There is a difference after all! Yes, compared the historic predecessor, the German law is stricter for bottom-fermented beer. So lager beer uses a subset of the ingredients that were allowed back in 1516. On the other hand, though, it means that modern beer can’t necessarily be brewed with all the freedoms that the 1516 law gave: brewing beer with unmalted barley, which was allowed 500 years ago, is prohibited under current law. But only for bottom-fermented beers. So what about top-fermented beers then? Just have a look at Vorläufiges Biergesetz, § 9 (2), which states that other ingredients are allowed as well, specifically malts made from other grains (such as wheat, rye, oats, spelt, buckwheat, …), “technically clean” cane sugar, beet sugar, invert sugar, starch sugar, and colouring made from these sugars. These are all ingredients that are allowed in the current law, but definitely fall outside the 1516 law. So, depending on the beer that you’re talking about, a top-fermented beer brewed according to the current law, may or may not conform to the 1516 law. In summary, the modern law shows some similarities with the historic law, but even greater differences. Any beer style brewed with any other malt than barley malt, is perfectly legal in the current law, but falls well outside the historic purity law. The claim that German beers are brewed according to the 1516 purity law is definitely true for some of them, but is not reflected at all in either the current legislation or some of the popular German beer styles nowadays. And that’s just when we’re looking at the ingredients. 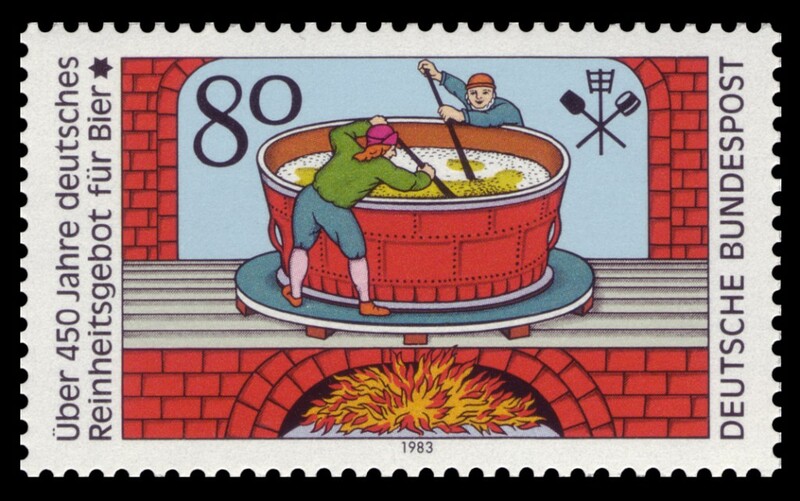 The Vorläufiges Biergesetz (§ 9 (6)) contains some more points in what other things may be used in the production of beer. It specifically allows anything as clearing agent for wort and beer that works mechanically or adsorbing, and that can be removed from the wort or beer again, with the exception of small amounts that are “technically unavoidable” and hygienically, olfactory and taste-wise harmless. So beer can be filtered, as long as the stuff that is used for filtering can be mostly filtered out, but don’t worry about it, because anything that is left behind in the beer won’t harm you, and you won’t taste or smell it. Beer is filtered to remove haze and other matter that may have a negative impact on the shelf-life of the beer itself. That process is usually called stabilization. As long as the stabilizers that are used are natural, it’s still okay, right? Unfortunately, no. A very common and popular filter is PVPP (polyvinylpolypyrrolidone), which is sold under brand names such as Polyclar, Divergan, or Crosspure by various manufacturers. PVPP is added as a powder to the beer, clarifies and stabilizes the beer, and leaves behind a slurry on the bottom of the bright tank. This is perfectly fine under current law, but it’s also something that at least I would consider an artifical stabilizer. So, when carefully considering the current law, and comparing it to what reinheitsgebot.de says about German brewers still brewing according to the Reinheitsgebot, my conclusion is that German brewers can still brew according to the 1516 law, but the 1993 law gives brewers much more freedom in what is used. And, to my knowledge, German brewers do use these freedoms. In order to be able to discuss about the Reinheitsgebot, we shall first establish what the law text originally says, in its original language, and what it means in modern language. Wir wöllen auch sonderlichen / das füran allenthalben in unsern Stetten / Märckthen / unn auf dem Lannde / zu kainem Pier / merer stückh / dann allain Gersten / Hopfen / unn wasser / genommen unn gepraucht sölle werdn. Ganz besonders wollen wir, dass forthin allenthalben in unseren Städten, Märkten und auf dem Lande zu keinem Bier mehr Stücke als allein Gerste, Hopfen und Wasser verwendet und gebraucht werden sollen. Exceptionally so we want that henceforth, everywhere in our cities, market towns and on the countryside for no beer more pieces than alone barley, hops and water shall be used. So, the language is very clear: no matter where in Bavaria you’re brewing, all you’re allowed to use is barley, hops and water. A common question here is: but what about yeast? Well, the nature of yeast was not fully understand until several hundred years later. This ingredient being left out is usually interpreted that the use of yeast is implied, that is if you’re not relying on spontaneous fermentation. Another detail is also quite interesting: it specifically mentions barley, not malt in general or barley malt, but only barley. This is apparently based on the Munich purity law that had been enacted a few decades earlier, while other purity laws, such as the Landshut purity law, does mention malt, without a limitation to a specific grain. As I said before, the 1516 purity law was implemented as a harmonization, and thus overruled both the Munich and the Landshut purity law. Its emphasis on barley, and not malt, is quite a crucial detail here. I’ll discuss that in a later article. In 2016, the German Reinheitsgebot (beer purity law) is being celebrated to be 500 years old. According to some official document from 1516, beer is only meant to be brewed from barley, hops, and water, and has been the only brewed like that since then in Bavaria, and later in all of Germany. Or so they tell us. I, for one, am highly suspicious about this. My research into historic brewing, both in Germany and Bavaria, have shown me otherwise, that these are neither supported by documented historic brewing practice nor by the legal situation of that time. The Reinheitsgebot’s lobbyists proponents is mainly Deutscher Brauer-Bund e.V. who have prepared a website with lots of information for the anniversary, including a list of Frequently Asked Questions, to inform the public about this supposed 500 year old tradition that only wants the best for all of us beer drinkers. Having sifted through that material, I stumbled upon imprecise language, which is corrected and/or justified in other places. I suspect that the Reinheitsgebot proponents exactly know about all these imprecisions and inconsistencies, and yet resort to them because they serve a purpose. I find this highly problematic. I therefore decided that I will present my view on these matters in a “Frequently Questioned Answers” format, where I will point out and correct imprecisions and inconsistencies, all based on facts and backed by sources. In addition that, I will explain why I think the Reinheitsgebot, the official narrative around its history, and its practical implementation in the form of the current German beer-related legislation is not only unhelpful to German beer culture, but how it has also helped erase the rich historic Bavarian and German traditions that have gone beyond just barley, hops and water. With this series, I plan to further and enrich the discussion about the state of German beer and the planned 500 year celebrations, and help the discourse about the future of German beer.